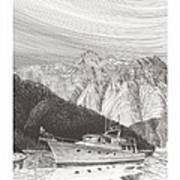 A pen & ink yacht portrait of a 65 foot yacht anchored in desolation sound, yacht portraits, yacht art, custom yacht portraits, yacht paintings, yachting art, yacht portraits, yacht art, custom yacht portraits, yacht paintings, yachting art, marine paintings marine art. 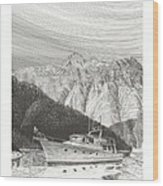 canvas prints of boats. 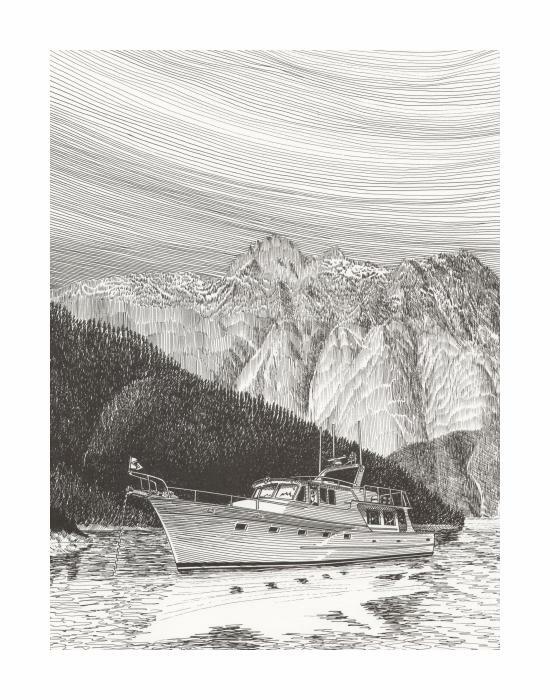 prints of boats. prints of waterfront art. canvas prints of yachts. framed marine transportation art, framed prints of a 65 foot yacht anchored in desolation sound, metal prints of a 65 foot yachtAnchored halfway between Seattle, WA and Ketchican, AK in Desolation Sound. Pure solitude.